Poet Dylan Thomas’s afternoon writing sessions were always preceded with his ritual visit to the pub at Brown’s Hotel in Wales. Photo by Noah Lederman. Devotees of Dylan Thomas head to Laugharne, a Welsh village that sits at the mouth of the Taf River, to peer into the famed poet’s writing shed, which gazes upon the scenery that served as his inspiration. From the shed’s windows, Thomas studied the landscape and strung together lines that readers still marvel at today. Take his eulogy to the birds that die blithely in the poem Over Sir John’s Hill. It begins: “Over Sir John’s hill, / The hawk on fire hangs still; / In a hoisted cloud, at drop of dusk, he pulls to his claws / And gallows, up the rays of his eyes the small birds of the bay”. While much of his writing in Laugharne was penned in that shed, nature hadn’t been his only muse. The pub also served as an equal partner in elevating his creativity. Though some associate alcohol as a culprit in Thomas’s death at age 39, this claim is no more substantiated than the others: he died from complications from pneumonia, a doctor’s miscalculated injection of morphine, or the influence of New York—the place of his death—where he indulged in the cocktail of fame and money. 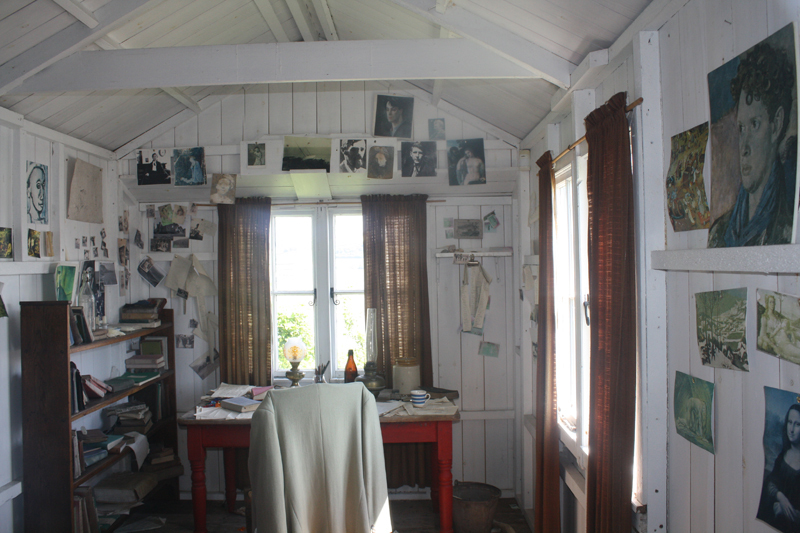 Poet Dylan Thomas’ writing shed sits at the mouth of the Taf River. Photo by Noah Lederman. What is verifiable, however, is that Thomas’s afternoon writing sessions were always preceded with his ritual visit to the pub at Brown’s Hotel. 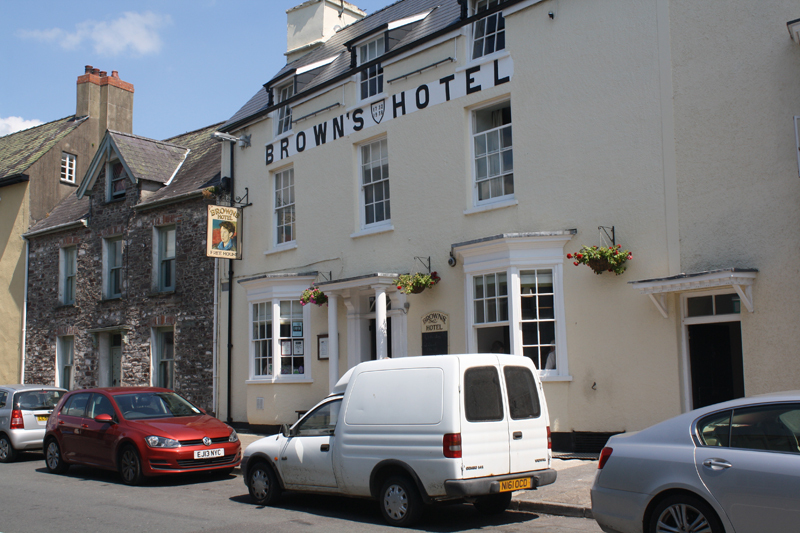 While most Welshmen in small-town Wales visit the pub because it is a social center more than it is a watering hole, Brown’s served as a Petri dish for Thomas’s prose. It was in this drivel at Brown’s, however, where he had gathered his gems. Eavesdropping on neighbors at the pub, for instance, delivered the eccentric cast for his play of voices, Under Milk Wood, which parodies life in Laugharne. Just before my visit, I read Thomas’s Laugharne, a radio broadcast in which he describes the place as one that “will all be the same in a hundred years’ time.” I wanted to see if this setting was still intact. When I walked into Brown’s, change had occurred. Brown’s had ridden the coattails of its most famous patron, turning pub into shrine. Thomas’s pictures, book covers, and the dartboards that he had played on decorated all walls. Inside the pub at Brown’s Hotel in Wales. Photo by Noah Lederman. As this year is the centenary of Thomas’s birth, I found it unlikely that the three local men at the bar had known Dylan Thomas. But the eldest of the group, Graham Thomas (of no relation to the poet) had been a teenager when the writer had died. “He’d sit in the corner, have a pint of the bitter, and go home at three,” Graham Thomas told me, as we sipped our bitters together. Graham Thomas continued, “I knew him little, but well enough.” Well enough to know his movements. 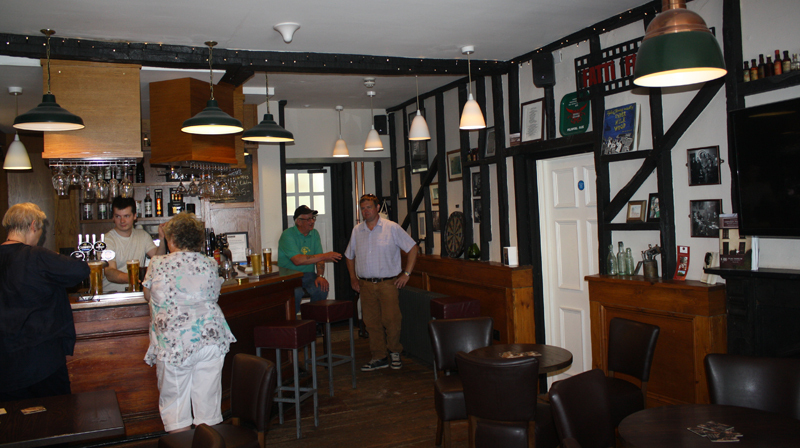 When Dylan Thomas visited the pub to thieve stories from the townsfolk, Graham Thomas explained that he and the poet’s son pilfered cider from Dylan Thomas’s shed. I sat beneath the photograph of Thomas, near his preferred seat, and listened as the locals debated the innocence of Boodha Roberts. I sipped my bitter as the sweet canards in Brown’s continued—ones that were most likely part show and part mundanity; for Thomas most likely cheerless and horrid. But because of the great writer’s early death, these men who filled the pub in Laugharne sounded to me like the epitome of Thomas characters, had—beyond this account—never inspired any paragraphs or stories, by and by. Noah Lederman writes the travel blog Somewhere Or Bust. His writing has appeared in the Economist, Boston Globe, and elsewhere. He tweets @SomewhereOrBust.